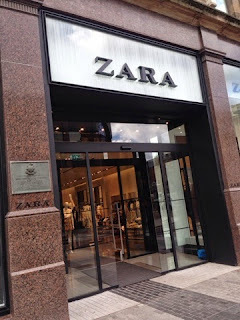 A journalist friend of mine was told by Zara this week that they were not re-opening their Belfast store. Well talk about panic as her friends (and mine) reacted to this news. It turned out to be the work of an ill-informed social media executive...more on that in a bit. To give a bit of background, Belfast Zara closed in late August following the fire in Bank Buildings, right beside Zara's premises. The Primark store in Bank Buildings was completely destroyed and the building rendered unsafe so Zara was forced to shut up shop until Bank Buildings were stabilised and the safety cordon removed. So since August, Belfast's main retail thoroughfare has been split in two by a cordon, which didn't allow any traffic through, including pedestrians. In December, a pedestrian tunnel was created and some of the units further away from Primark reopened. However, Zara and the Tesco Express on the other side of Bank Buildings remained shut. The fire has been really tough for the city - I hold my hands up and say that even though I made a concerted effort to support the city centre with my Christmas shopping, I didn't spend any money in the shops on the far side of the cordon from where I normally park or get off the bus. It's not intentional - more because there's this sense of divide, of difficulty to navigate, of sadness walking past the burnt out shell that was the beautiful Bank Building. Being really honest, there's not the same selection of shops the other side. Zara and Primark made that part of town a bit of a destination I guess so you were more inclined to keep going and maybe pop into H&M or Debenhams, while you were down there. My immediate reaction to the news that the store might not be opening again was indifferent. It had begun to gall me that a store like Zara continued to get away with the most rubbish customer service on the high street and with creating poor quality clothes that fed our fast fashion addiction. They were the ones that started the speedy turnaround on collections. Short runs of clothing and multiple drops on a monthly basis drove an addiction to the brand for many. If you didn't get *that* Zara 'must have' today, it would be gone tomorrow. And everyone else on Instagram would be wearing it...the torture! I know it's true because I got sucked in too. But strangely, every time I went into the shop, I found myself a bit disappointed. The fit and the quality was so hit and miss and it seemed I was almost forcing myself to buy something...just because it was Zara and that's where all the cool bloggers and stylish people get their stuff. I often bought items that I rarely wore, that didn't fit that well or that I ended up returning. And don't get me started on their less than cheery approach on the till when you wanted a refund. Time after time, I found myself faced with grumpy faced team members who were mostly irritated by your presence. How dare you interrupt their very busy and important job in uber stylish Zara to look for money back or do an exchange? You indecisive woman! I realised I was buying into a lifestyle, following a crowd, thinking that if I bought something from Zara, I had style...I was on-trend. It mostly wasn't. Maybe I bought badly but the amount of awful stock hanging on their sale rails last February (at still relatively high prices), confirmed to me that Zara wasn't what it used to be when it opened first. In the end, early last year, after witnessing that sale rail fail and at the same time I started reading Lucy Siegle's book ' To Die For', I made the decision to stop buying from Zara. And it's not been too hard to stick to this. Admittedly, the closure of the Belfast store at the end of August took the opportunity away from me but I've not even looked online in that time and I don't think I've missed much. I've enjoyed buying unique, less ubiquitous pieces from local boutiques instead. Putting a bit more cash into less frequent purchases and supporting smaller businesses...and it feels good. So I wasn't mourning the loss of Belfast Zara but then I was notified via my Facebook page that it IS in fact opening again in April 2019. In fact, they're currently prepping the unit ready for the stock to drop. Cue many happy comments! I'm not going to be rushing in anytime soon but I am happy for Belfast and the surrounding businesses which will no doubt see footfall increase once Zara is open again - especially when it becomes possible to walk easily between it and the new wing of Primark (which wasn't damaged in the fire and has re-opened recently). Totally agree with you about Zara's lack of quality, its inconsistency and the way it has promoted fast fashion. I'm not spending my money there either!